totally awesome links! And now I will be on the same page, and using the same ref material as others. Hopefully it's accurate eh, and not the "iron in spinach" debacle PopEye got into. ;) looks like it should be! So next time you see a bird looking in through your window, and they keep calking their head from side to side, They aren't being stupid, they are thinking "next pic? please? come on! Fast forward or something." Render 1: Stopped manually at 87% after 7.5 minutes, 1100 intinerations. Noticeable fireflies. Render 2: Finished at 100% after 28.5 minutes, 4423 itinerations. VERY slight decrease in fireflies. Render 3: Finished at 100% after 15 minutes, 2320 itinerations. Nominal Luminance (under Firefly Filter Enable) set to 5, Noise Filter set to On with default settings. Slightly less bright fireflies, but the exact same amount as Render 2. I was going to try raising Quality, but do you have any recommendations? Do you think raising it to 2 would have any noticeable effect? Any advice is appreciated. generally fireflies denote too high gloss/reflectivity. So far I haven't had an issue with fireflies and I have a lot of glossy surfaces in my new test scene. I know this is OT for this thread, but speaking of the mouse over the viewport how do I get rid of the flashing with the pointer tool. We had the option before but I can't find it in 4.8. Not in tools or prefs..where is it? Window > Panes > Draw Settings, Editor tab, set “Draw Style” to “Bounding Box Only”. There's lots of information at the various light manufacturers websites. But there is considerable variation in values and measurement methods. $50K in that keynote address on YouTube. More than the car that is being modeled in the demo. The fantasy of buying one did cross my mind briefly. I lay down until I felt better. yeah eh. sell my house. and my car. and my neighbours house and car. Oh wait, where will I put it then? I'll be the only homeless guy with a VCA render farm though! you have to select the Surface Selection tool which brings up the options in Tool Settings pane. Thanks for replying, Pete. All selections in the tool pane for the node selection tool (arrow) flash surfaces when the pointer passes over the object. In 4.6 the bounding box shows when selected (little corners) and those corners turn orange when passed over, not the surfaces--at least you have the choice for it. With the new stuff, is there another place to find the 'drawing style' that was part of the tools setting? ...when I use Dome/Scene though the scene renders dark. when I switch to sun - sky it renders correctly. Sorry, no screenshots. Maybe I can post some after dinner. you stopped playing with Iray to eat? Is that allowed? I suppose it's physically plausible. Doesn't sound real-world to me though. LOL tell me about it I never saw the new Draw Style Pane as Mike above pointed out, thanks Mike. I'm still sticking with 4.6 until the AoA light is working again (totally borked in 4.8). There was a new set of presets for using AoA's ambient light in the store yesterday or the day before so there's certainly hope. I'm still sticking with 4.6 until the AoA light is working again (totally borked in 4.8). You may need to reinstall the AoA lights for the Public Build/Beta, it may not be the 4.8, it may just be that they need to be reinstalled. I don't understand you question. Are you asking me or the moderators? There are rules about Iray? I'm confused. I think I can take a screenshot using the key that says "Print Screen". Could use some help on several issues. I've been fiddling with a scene including one genesis figure, hair, three GIS clothing items, Level 19 and one camera, for several hours, while alternately reading this and other Iradium threads. As I read, I flip a switch or try a new number here and there. Things just aren't working well. 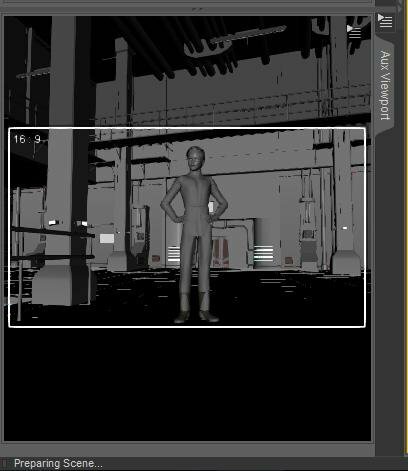 As I nudge settings here and there, my aux Iray preview window, at best, shows the scene with most objects colored grey and no lighting or shadow effects, beyond basic shading, as if I'd set the window to Smooth Shaded. Meanwhile, as I type and while I read the last three pages of this thread since my last change to the camera or tone mapping, (I don't remember which,) my status bar has been stuck, "Preparing Scene..." with the progress bar cycling countless times, about every four seconds. I've attempted original and very high (kept pumping zeros after the 5, well into the billions) numbers for luminance on my emissive surfaces, to no effect that I can see in any window, since originally applying the shader and fixing the emission colors to look like the original default shaders did onscreen...again, it was so many tweaks ago that I don't remember if they used diffuse or ambient. I hit render once a couple hours ago and Studio simply stopped responding altogether. I'm not bothering with that again until I see something reasonable in the Iray preview. Ah, and it's warm in here today, lol. My comp just beeped once, the way it does when I set it to doing 3DL renders for more than five minutes or the outside temp is around 100F. Nice. Scene file and a screenshot linked below; perhaps one (more are welcome) of you may be able to debug some of the problems I'm having. Any help would be much appreciated. O..the headlight is active at the moment because without it, everything but my emitters and the transparent glass was black. The light emitters look like nothing but ambient surfaces, either way, rather than actual light projection. Can anyone please help with this log file warning. My render has appeared to stop after 91 iterations and hasn't changed in the last 2hrs 25 minutes. I looked at the log file and found the following warning after the 91st iteration. Any idea what it means ? Iray INFO - module:category(IRAY:RENDER): 1.0 IRAY rend info : Received update to 00083 iterations after 1087.729s. Iray INFO - module:category(IRAY:RENDER): 1.0 IRAY rend info : Received update to 00085 iterations after 1113.389s. Iray INFO - module:category(IRAY:RENDER): 1.0 IRAY rend info : Received update to 00087 iterations after 1139.222s. Iray INFO - module:category(IRAY:RENDER): 1.0 IRAY rend info : Received update to 00089 iterations after 1164.983s. Iray INFO - module:category(IRAY:RENDER): 1.0 IRAY rend info : Received update to 00091 iterations after 1190.832s. 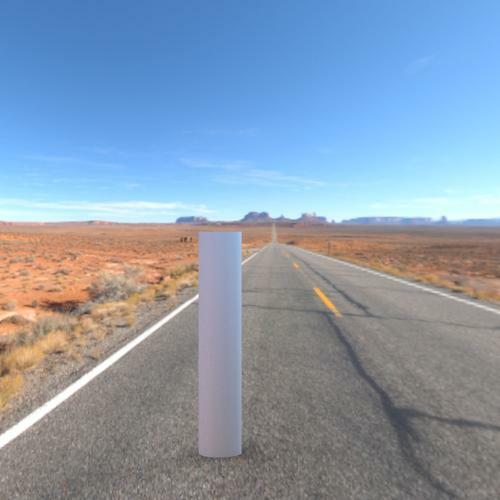 Even a render of a simple cone with one photometric spotlight completed 100% of the render, yet still had a warning during the process. Is this something that needs a support ticket to DAZ as part of usage feedback ? Iray INFO - module:category(IRAY:RENDER): 1.0 IRAY rend info : Received update to 00368 iterations after 893.778s. Iray INFO - module:category(IRAY:RENDER): 1.0 IRAY rend info : Received update to 00373 iterations after 905.664s. Iray INFO - module:category(IRAY:RENDER): 1.0 IRAY rend info : Received update to 00378 iterations after 917.628s. Iray INFO - module:category(IRAY:RENDER): 1.0 IRAY rend info : Received update to 00383 iterations after 928.103s. Iray INFO - module:category(IRAY:RENDER): 1.0 IRAY rend info : Received update to 00403 iterations after 967.537s. Iray INFO - module:category(IRAY:RENDER): 1.0 IRAY rend info : Received update to 00411 iterations after 976.264s. Iray INFO - module:category(IRAY:RENDER): 1.0 IRAY rend info : Received update to 00480 iterations after 1097.015s. Iray INFO - module:category(IRAY:RENDER): 1.0 IRAY rend info : Received update to 00488 iterations after 1099.970s. I would recommend watching this [url=http://www.deviantart.com/users/outgoing?https://www.youtube.com/watch?v=L5FZ5gS9v50]video by Sickle Yield as she is working with a figure in an enviroment that is similar. How did I miss this thread, thanks Szark. I spent the past week blindly clicking things, and making allot of assumptions that were way wrong. Mostly as I was working with lights made for 3delight, and trying to figure out a common ground in Iray. Turns out, with the Photometric lights, the Lumen value is ONLY for Iray, and dose nothing in 3delight. Given that I foolishly left the intensity at 100%, and the test chamber had UE2 going, it appeared way over exposed in 3delight, and the UE2 made it look like the Iray shader converted Omni Uber Area lights were doing something there. Yesterday, I set out with ALL the lights OFF except for the one I was trying to convert over, and discovered that the Iray shader emmitter dose NOTHING in 3delight, and the Lumen value on the Photometric lights. After twelve hours of plugging away ate single light test renders to attempt to compare light levels, and then that.. I threw in the towel. I needed a completely different set of test chamber soft-box lights for each engine, and I needed to re-learn what was what all over again. Just what was a "Lumen" in terms my eye has had experience with, and for the life of me, I can't completely remember what shutter speeds I had used in school over twenty years ago, lol. This morning I looked up and made a short incomplete chart, posted here. Switching to a Finite Dome makes those dome settings visible. Yes but the depth, width and height has to be unhidden. Once unhidden, when I dial them up, I see no change to the sphere. I get a serious fisheyed look when I reduce the hdri size (to match figure scale), so I was hoping adjusting the depth would counter that, but it does nothing from what I can see. Try using finite box dome mode instead of sphere. Sliders are automatically unhidden in that mode. And it looks like some form of automatic conversion is going on, since HDR image is spherical (made for sphere), but its not bended when its in box mode. Khory had asked me about some reflections in the color scale cube, and I was so far behind the ball, I hadn't a clue what was going on. I still don't, lol. 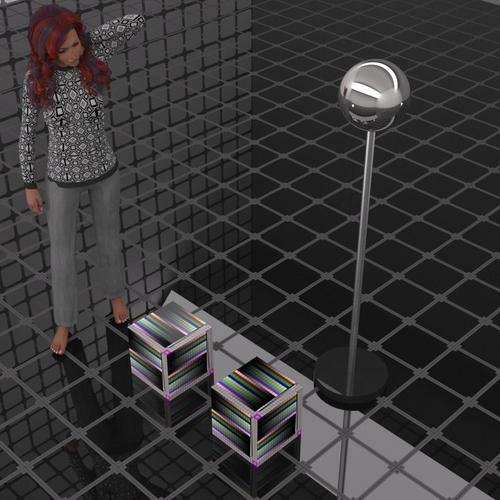 As soon as I zoomed into the cube to try to calibrate some lights, I noticed it had gone reflective on me in Iray. Apparently when you have no reflection or gloss at all with the daz default shader, Iray still puts some reflection on the surface. I don't recall photographers color-scals ever being anything other then 'mat' finish. 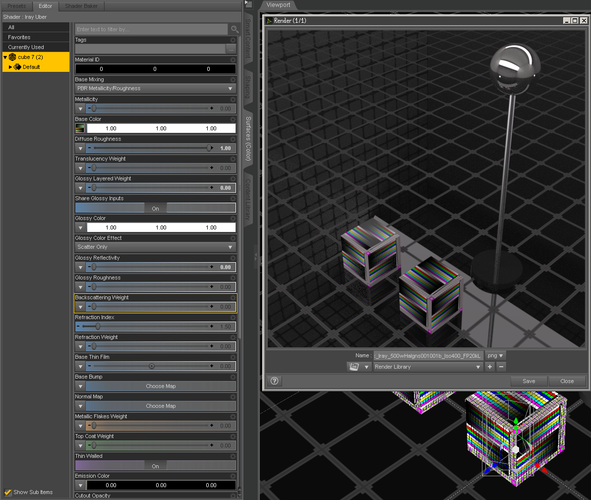 Test render Cube on the left is the Daz default shader one, the one on the right is the Iray one (settings shown in the tab). Thanks, Cris. I did finally look at that last night and it was helpful. I'll scrap that scene as there's too many things to dig through and start a new one for experimenting, when I've the time. ZDG, in Iray, specular and reflectivity are the same thing, as it tends to be in real life. (Rough surfaces still reflect, they just scatter it away from your eyes, so you don't notice.) The Iray shader converts spec settings to reflection, so anything that had spec, now has reflection. Check out SY's video, linked in Cris' post above. Very good. Floor, DazDefaultSahder, 50% reflection, specular map, and diffuse. Looks perfect in Iray. Color cube, DazDefaultSahder, just diffuse. zero reflection, zero gloss (aka 100% on dial), zero specular. should appear like a mat surface (it dose in 3delight)? shouldn't it? As for the Iray settings? pure mat finish with diffuse color only? Are the settings in the screen-cap correct? SY Vid, still taking notes on that. Playing with tone mapping settings, sorry I don't remember the names of the values I changed. Two mesh lights; one a large sphere above the well, one a plane behind the camera, both are set to 100 watts. Environment set to Scene Only. Set to render for 4 hours, I don't know how long it actually ran. CPU only. Could you post a link to one, because I couldn't find any settings as clear as what hphoenix posted. I'm still trying to find out decent settings for candle light. Numbers like those are great for new users who may be completely new to realistic rendering. search for photometric lighting, should get results like: http://bit.ly/1ENAdBs along with many articles. I used to have some specific articles that explained architectural standards in lighting but don't have the links handy at the moment. Been digging as I go today. No 'Candles' yet, tho a 40 watt bulb is close. 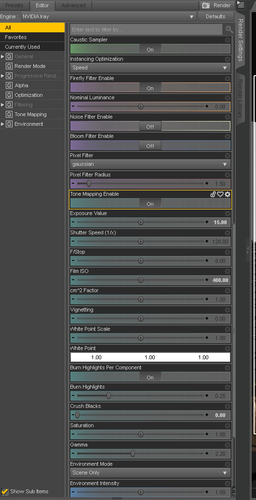 Tho that chart is for actual Lumens, not Studio4.8 default film settings as it would appear in the render. ISO 1600 - night scenes, candlelight, etc... can even go beyond that but in real cameras, loose most of the color in the scene beyond that. Aperture is the opening created by the blades inside the lens when they open. These blades can open different amounts, from pinhole to almost full open but will never be 100% as that is mechanically impossible. The aperture is an inverse number (1/(over) opening [roughly]) so that if the opening inside was 100%, it would be f(1/1) = f1 (again, impossible.) The exact formula can be confusing so I'll skip it as the main thing to understand is that the larger the aperture, the smaller the opening for light to get through (blades between outer and inner lens.) f32 is a very small opening. Now, aperture and shutter speed are intimately linked (forget ISO as that should have been set as your base, so these two are all that really matter.) How they are linked will make sense in a moment. Shutter speed is how long the shutter is open. Simple enough. How this comes together is the key though, and why shutter priority and aperture priority are two of the main settings people using digital cameras might want to use. Light comes into the lens like a plug (of light.) We need the same amount of light for a given scene to be lit properly, either long thin plug or short fat plug. This translates to smaller opening (larger f/stop, remember, inverse) with longer shutter or larger opening (smaller f/stop) with shorter shutter. A short plug will 'freeze motion' and a long plug will show motion blur. A fat plug will have shallow depth of field, and a narrow plug will have a wide depth of field. - For a portrait type picture where we want the background blurred out, we would adjust aperture to as close to wide open as possible (f1.8, etc...) and use a shorter shutter speed to compensate. - For landscape photography where we want everything in focus, we would set a small opening (high f/stop) then of course adjust our time open (shutter speed) to give us the correct total amount of light. So for landscape/portrait, use aperture priority, for sports, shutter priority. As to light temperature, candlelight tends to be orange, incandescent was usually a reddish tint, and the old florescent bulbs pulled blue (but this changed as manufacturers came out with more choices without having to special order.) Sunlight is as close to neutral as we get. The exact temperatures of various lights are available with some quick Google searches but that's the jist. Another point about lights, different lights have different spread patterns, so no current lights in render engines will properly simulate that particular feature at the moment. We are still very much at the beginning of standardized lighting/materials in 3D space. Hopefully this makes sense and is helpful for some who haven't done much photography. * Forgot, another note about lighting... besides the 'red = warm, blue = cool' we are used to, there is another thing about temperature some might not know. Warm lights (not warm as in kelvin but as in red) smooth out skin tones, wrinkles etc, that is, they 'loose detail.' Cool lights bring out detail, besides being cold. This is pretty well understood by most women who have done their makeup under different lighting conditions. This blurring or sharpening of detail adds to the general feel of the lighting, ie comfortable vs sharp/harsh. That is incredible Gedd, and something I wish I was aware of the off render settings a week ago. Many in the other thread have been poking a prodding ideas, and I've read up to page 11 here. My only saving grace is the CPU only rendering takes bloody ages on this computer, lol. This is the former posted test, with more adjustments to the lights, and still some doubts with the cubes (left one DazDefault, the other Iray shader). ISO400, Crush Blacks at 0.0, the rest at default for Tone Mapping. Caustics on, Just rendering the scene (no sun or sky). 40ft x 40ft room, 20ft ceiling, all daz default shaders (ZDG test chamber). Three 500 watt halogen (10,000 Lumen) Photometric spotlights, and two 36,000 cd/m^2 Iray emitter panels. 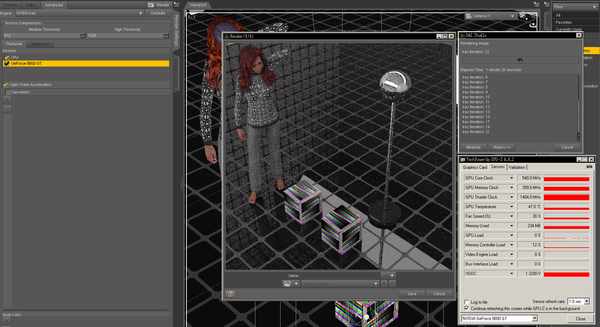 The mirror ball is using the Iray "Metal Silver" shader preset, the pillar "Aluminum Brushed". FW Yasmin all stock from another 3delight scene, ya, that's how I feel about now. I got run over by Iray, lol. Ended on time-out, 2 hours, 803 iterations, about 68% converged. As to light temperature, candlelight tends to be orange, incandescent was usually a reddish tint, and the old florescent bulbs pulled blue (but this changed as manufacturers came out with more choices without having to special order.) Sunlight is as close to neutral as we get. The exact temperatures of various lights are available with some quick Google searches but that's the jist. I've seen some charts depict true neutral at about 5k, and others about 6k??? Tho K is often for a curve depicting where the center of the highest intensity of light output is, not for a true flat full spectrum CRI light (If there ever will be such a thing), lol. Another point about lights, different lights have different spread patterns, so no current lights in render engines will properly simulate that particular feature at the moment. We are still very much at the beginning of standardized lighting/materials in 3D space. I was a bit over simplistic in saying sunlight is as close to neutral, since it varies quite a bit depending on time of day/season, etc... but the general temperature attributed to average noon sunlight is around 5500k. OK, was a tad confused by the many different charts with true-whit at different points. roygbiv dose not have white?, lol. If only I could get them other 32 calculators doing something useful other then wasting electricity lounging around under that heat-pipe cathedral, lol.